Last week, during a visit to Firaxis to have a look at XCOM: Enemy Unknown, I had some time to talk with the game's art director, Greg Foertsch. Foertsch discussed the challenges of creating both recognizably human art and architecture, as well as alien shapes, and the process of blending the two together as the game progresses. One major challenge for the art team, explained, was making people who looked like, well, people. Though the game generates soldier appearances to begin with, players can then customize the names, racial appearances, and styles of their quads however they wish. I remarked that in the game as I had seen it so far, I noticed a compelling racial diversity among the soldiers, and assumed it was intentional. Foertsch agreed, and added, "We spent a lot of time on the women. When Jake [Solomon, lead designer] and I thought, how are we going to... We want this to feel diverse. We want this to feel worldwide. Just having dudes that have tinted skin [won't work]. Each one is more than just tinted skin. We tried to push [facial structures and] features to be ethnically correct." 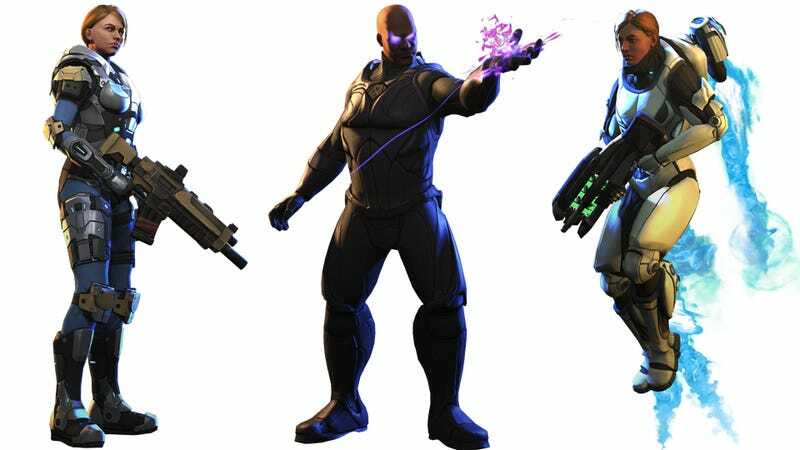 The soldiers of XCOM are drawn from over a dozen member nations worldwide, across continents. The team wanted the racial diversity of the world to be represented by more than just, well, a skin change. And half the world's population are women, a group too big to ignore. Foertsch: "We want this to feel worldwide. Just having dudes that have tinted skin [won't work]." "Half of [diversity] is getting women in the game," Foertsch said. "So we've worked out some black magic on the rig end so we have only one set of animations, for the most part. But women have a different run, things where you notice... We were actually able to [make] women where we don't have to hide the fact that they're using a male physique with shoulder pads. That was really important to us. So they have, like, shoulders that look like women's shoulders. They still look badass! But we didn't have to put them in a thong and high heels." He trailed off for a moment, clearly thinking. "That was something that we really... I have two daughters now. Jake has a daughter. And I don't think either one of us really wanted to go down that road. That's just not who we are." "We just didn't want to play with that lowest common denominator," Foertsh concluded. "I'm very proud of the fact that we actually got women into the game that look like women." Whether or not women and female characters are an afterthought in the development of many games, they certainly feel like it. While body types are still limited by the need of the soldiers to be soldiers, that the team put effort into making sure its human soldiers actually represent the breadth of the human race they're trying to preserve and save is commendable.